A new read for a new year. A new read for a new year. The January issue of Eye On Independence is hot off the press and at our usual locations. 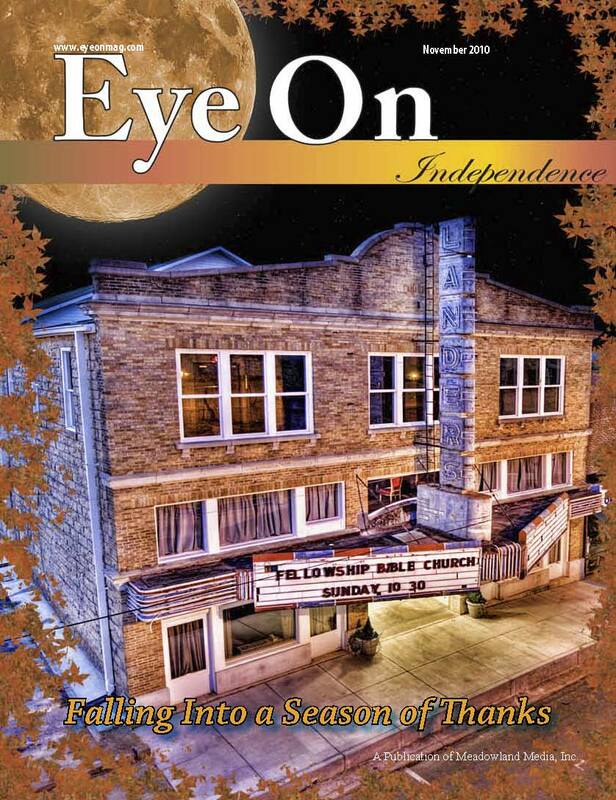 Make it a resolution to read Eye On and see what's up in your community. Happy New Year! December Issue is out and about and ready for your read. When you stop by one of our local merchants, please grab a copy for yourself and have a very, Merry Christmas. We are placing the November issues of Eye On, so check our locations, drop by one of our fine sponsors and pick you one up...or if you don't want to get out, sign up for your very own subscription now. We are eagerly awaiting the tangible evidence of another month of work, and fun....with a dash of play, as well. We want to thank all of the wonderful organizations that are the focus of this November issue...and, of course, you the reader. We will see you on the streets. Eye On is busy finalizing the November Issue and would like to thank all of our faithful readers for their feedback and eagerness for each new issue. We are excited and growing! We still want your input and comments, so keep 'em coming and we hope you enjoy every falling leaf of this beautiful season. HI, I am looking for ideas for my column, Fork in the Road. I am interested in out-of-the-way places around the region: bakeries, coffee shops, markets, etc. Just email me at bobpest@wildblue.net with your ideas. 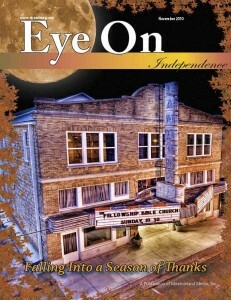 Thanks for reading Eye on Independence.